In the 18th and 19th centuries locks were not the only pieces of hardware mounted to architectural elements. 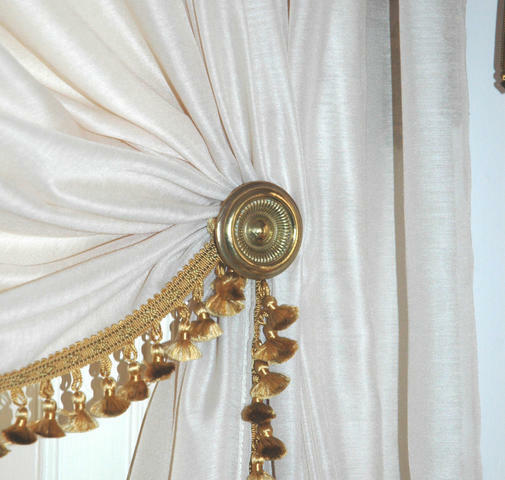 Curtain pins, which usually were formed from a long post with a metal or glass disk attached to the top, were commonly found on window trim. These pins were usually mounted onto the face of the window’s trim with a screw that had been embedded into a small, metal disk and were used to hold curtains open. Using techniques similar to those architectural historian Mark Wenger used to identify and record the Madison-era locks, the Restoration Team was able to identify the locations of curtain pins on the surviving Madison-era trim and then, by using paint analysis, determine which of the holes most likely dated to the Madison period. A restored curtain pin found in the Moses-Myers house (ca. 1797; Norfolk, VA).